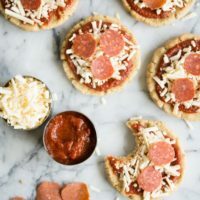 Homemade Pizza Lunchables - Wellness & Healthy Living - Recipes, Blogs, Podcasts & Books | Fed & Fit - Kid-Friendly and so easy! Lunch box sized assemble-your-own mini pizzas! Mix dough according to direction on box. Make your dough into 6-7 balls of dough, and then press each ball into a small circular crust, approximately 4 inches in diameter. Place each crust on a lightly greased baking sheet, and bake for 10 minutes. Remove from oven and let cool completely if packing for lunch, or assemble topping and consume when cooled right away. For storage, I would place in an airtight container in the fridge until consumed. For lunch packing purposes, I recommend if packing more than one, place a square of parchment paper between. Assemble toppings in separate small containers or in your bento box. When ready to eat, layer tomato sauce on first, then top with shredded cheese and pepperonis.